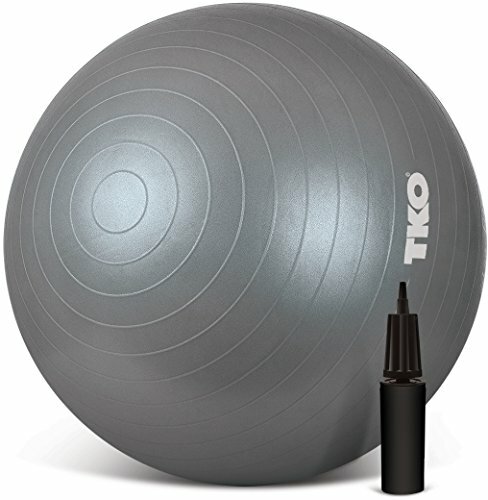 The TKO Anti-Burst Fitness Ball with Pump and Instruction Chart is a quick favorite of anyone that is looking for the perfect exercise ball for yoga, pilates, and general core training. With its anti-burst feature and its guarantee to hold up to 1,000 pounds of weight, the ball can withstand whatever punishment you try to throw its way, whether you’re going for some intense exercising or just using it as a replacement chair. The ball itself has raised rings around it to minimize accidental slipping and give you as much control as possible as you use it. The ball is also extremely easy to keep clean, as you only need to take soap and water to it when you feel the need to wipe it down after a workout. Generally considered to be one of the top 5 balance balls on the market, the TKO Anti-Burst Fitness Ball is an impressive addition to anyone’s gym, home, or office. This exercise ball is perfect for beginners and die hard exercise enthusiasts alike. Whether you’re looking to use it as the perfect yoga or pilates ball, or have every intention of making it a part of an intense exercise regiment, this exercise ball is definitely one to consider. As with most exercise balls, it’s great for anyone with joint problems or injuries that keep them from participating in most exercises or from using most exercise equipment. With an exercise ball, the user can simply replace their office chair, kitchen chair, ANY chair and get results in no time. Simply by balancing on the ball, the user can strengthen, tone, and tighten their core without doing damage to their joints or any injured areas. Also, just by sitting on the ball you can greatly improve your posture, as it forces your spine into alignment and your knees into a 90 degree angle. That is, it will as long as you make sure you have a ball that is large or small enough to fit your particular size and needs. For example, the 55 cm size is perfect for anyone between 4 feet and 8 inches tall and 5 feet and 5 inches tall. The ball comes in three sizes (55 cm, 65 cm, and 75 cm) and three colors (gray, blue, and black). The TKO Anti-Burst Fitness Ball with Pump and Instruction Chart are definitely worth every penny, and absolutely worth the time it would take you pump it up and have a seat on it.